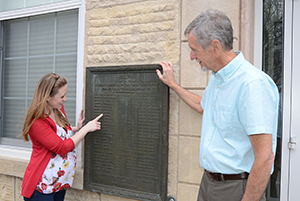 Christine (Woods) Grodek and her father, James, are pictured finding the name of her great-great-grandfather, Philo Woods, listed on the University Recruits plaque outside Alexander-Dickman Hall at Fayette Campus. A chest filled with family treasures not only led a Virginia woman to delve deeper into the life of her great-great grandfather but also to visit the University Archives at Upper Iowa University’s (UIU) Fayette Campus. Christine (Woods) Grodek started researching her ancestor and UIU alumnus, Philo Woods, a few years ago after receiving the trunk from her father, James. A self-proclaimed history nerd, Grodek believes her extensive genealogy research makes the past come alive and more personal. She connects to remarkable times in American history, such as the Civil War, knowing that an ancestor like Philo Woods was fighting in historic battles. Grodek’s specific interest in her great-great grandfather piqued after uncovering a number of Woods’ family correspondence and being informed of a known collection of missing Philo Woods’ Civil War-era diaries. Philo R. Woods was a member of the “University Recruits” 12th Iowa Regiment, Company C. He enlisted September 15, 1861, as a private and was captured at Shiloh on April 6, 1862. Woods re-enlisted as a veteran on December 25, 1863. He was promoted to corporal on April 1, 1863, as sergeant on March 1, 1865, and mustered out on January 20, 1866. He is recorded in the University Archives as being elected the Philomathean Society president on December 7, 1866. The fraternity was the first student organization at Fayette Campus. It was organized the first year of classes in 1857. UIU Archivist Janette Garcia noted that it can also be confusing because the name of the society was often shortened to “Philo.” Philo Woods graduated with Bachelor of Science degree from UIU in 1882. He also served as a tutor and instructor in mathematics at UIU from 1880-82. An 1875 edition of “The Collegian” reports that he taught in Ossian, Iowa. During her recent visit to the University Archives, Christine (Woods) Grodek and President William R. Duffy examined a few of the documented materials related to Grodek’s great-great grandfather, Philo Woods. 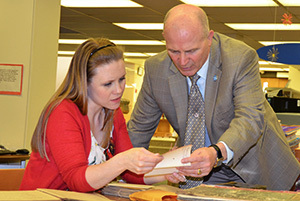 During their one-day visit to the University Archives, Grodek and her father were showed the University Recruits’ hand-sewn Civil War flag, field desk and other artifacts that are being safely preserved at Fayette Campus. Unfortunately, the Philo Woods’ diaries have yet to be uncovered. As part of their Iowa visit, Grodek and her father also toured the Tama area where much of the Woods family lived for several generations. In addition, they visited local cemeteries where Philo Woods and his wife, Emily Churchill, and Grodek’s grandfather, Arthur Woods, and many other Woods ancestors were buried. Grodek intends to continue her research by contacting the Iowa Historical Society in the hope that they may have more information on Philo and other ancestors. In the meantime, she is also keeping her fingers crossed that one day the missing Philo Woods diaries will be discovered hidden away at the University Archives or another historical institution. 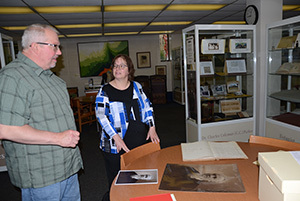 Jon Disburg of Ottumwa, Iowa, was among the recent visitors to meet with UIU Archivist Janette Garcia at the University Archives. Disburg’s great-great-grandfather was William Brush, UIU’s second president from 1860-69. Brush partnered with Henry Hurd to start the National Business College at Fayette Campus, which was the precursor to the University’s business department and alternative education program. The Foster Cass Archives Walk provides a self-guided tour of UIU’s extensive collection featured across Campus. The centerpiece of the exhibits and displays is The University Archives, which is located on the first floor of Henderson-Wilder Library. During a visit to the University Archives, alumni and other guests are invited to participate in the Oral History Project. As part of the interactive exhibit, visitors may record their own story to become part of the collection or view previously recorded alumni stories. To contribute to the UIU Oral History project, visit uiu.edu/resources/archives/oral-history/oral-history-contributing.html. To view the digital archives, visit uiu.edu/digitalarchives. For additional information about the UIU Archives, contact Janette Garcia at garciaj26@uiu.edu or at 563-425-5722.